Smackover High School tenth grader, Tucker Henderson, has been accepted to attend the Arkansas School for Mathematics, Sciences, and the Arts (ASMSA). ASMSA is one of thirteen public, residential high schools in the country specializing in the education of gifted and talented students who have an interest and aptitude for mathematics and science. Application is open to any sophomore student who resides in the state of Arkansas. For more information about ASMSA, click here. Posted in Uncategorized on February 29, 2012 by The Buckaroo Blog. Smackover Elementary School students recently collected donations for the American Heart Association. Our school’s goal was $1000. Our students more than doubled the goal by raising $2,112. WAY TO GO, SES! The donations support the American Heart Association’s efforts to create healthier lives, free of cardiovascular diseases and stroke. Since 1978, Jump Rope for Heart has raised more than $810 million for research and educational programs. Reagan Richardson was the top fund raiser for this year’s event, raising over $400. We are proud of her efforts and the efforts of all of our students taking part in this worthwhile endeavor. Posted in Buckaroo News on February 28, 2012 by The Buckaroo Blog. The Jr. Beta Club at Smackover High School recently sponsored “Pennies for Patients” for the Leukemia Society. Mrs. Shelly Childers 1st period Algebra I class won the breakfast treat for collecting the most money in their collection box. The Jr. Beta Club made a $125 donation to the Leukemia Society. Posted in Buckaroo News on February 27, 2012 by The Buckaroo Blog. Have you wanted to learn more about the Common Core State Standards for Math and English Language Arts? If so, then you are invited to attend a regional summit on Thursday, March 8, 2012, from 5 – 7 pm at the South Central Service Cooperative in Camden. Information about the new standards will be presented from the Arkansas Department of Education and Arkansas ASCD. To register for the event, please call Brittney McKenzie at (870) 836-1631. For more information about the Common Core State Standards, click here. Posted in Buckaroo News on February 26, 2012 by The Buckaroo Blog. To learn more about Read Across America Week, click here. Posted in Uncategorized on February 25, 2012 by The Buckaroo Blog. These students were selected based on their academics, leadership, and belief in God and country. If you would like more information about Boys State, click here. If you would like more information about Girls State, click here. Posted in Buckaroo News on February 24, 2012 by The Buckaroo Blog. 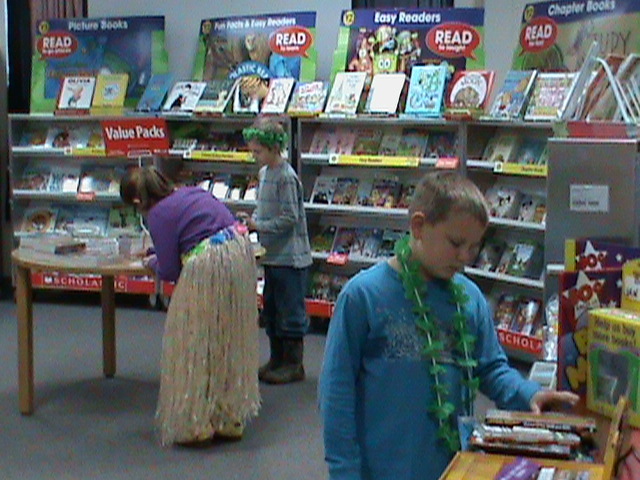 The Smackover Elementary School Scholastic “Reading is a Celebration” Luau Theme Book Fair was a huge success! Thanks to all the students, parents, faculty, and volunteers who participated in the Book Fair. The profits of the Book Fair will buy new books for the library, pay for various activities for the library, and support the end of the year trip for the top students who read their AR goals. Posted in Uncategorized on February 23, 2012 by The Buckaroo Blog.